I came across this vintage zipper from my grandmother in my stash and thought I’d use it as an exposed zipper in a project. I was drifting off to sleep, often when inspiration hits me, when I thought about pairing it with this cotton sateen I saw at Joann fabrics. I was hoping this knit red top would be a natural outfit, but meh, I’m liking it much better with this blue blouse. 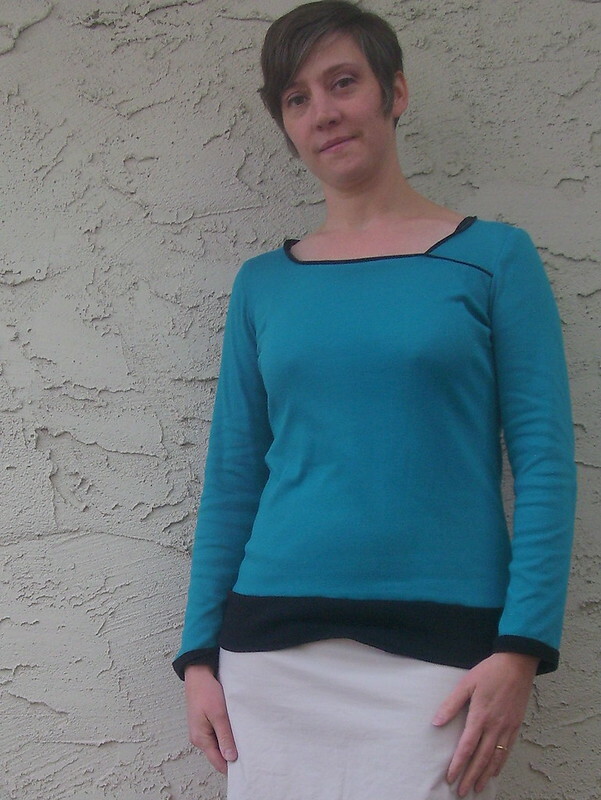 I’ve sewn up Simplicity 2451 view B in the past and really like how it fits me, so I chose view D feeling confident on a good fit. I had to lengthen the back darts an additional 3/8in for a better fit, but nothing else needed alteration. A couple new techniques for me on this skirt. I sewed the exposed zipper using this tutorial from Pattern Runway as a guide, next time I might try to figure out how to encase the end of the zipper tape for a nicer interior finish. I also used a stretch lace hem tape for the first time. I wanted to avoid the bulk of a double folded hem and keep as much length as I could. The tape worked perfectly. Overall I’m pretty pleased with my Orange Zip skirt. The fit at the waistline and hips is spot on. On the down side, the cotton sateen is a bit stiff at the front pleats and poofs out a bit more than I’d like, but that’s not going to stop me from wearing it. Here’s to more stash busting. 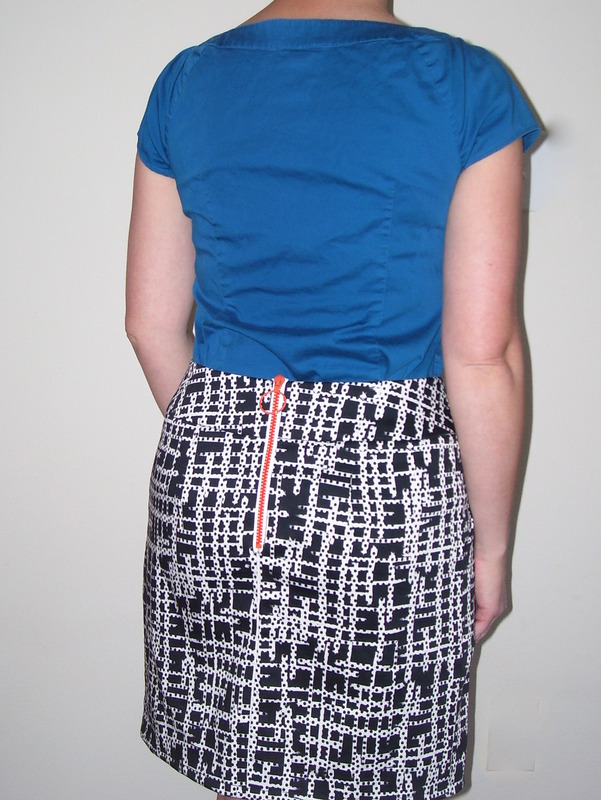 I used a pattern, zipper, and hem tape from my stash. Simplicity 2451 View D should take you about 2.75 hours to complete. Theres nothing like purple to make me happy and to help break out of the basic colors I’ve been using to build my Core Wardrobe. 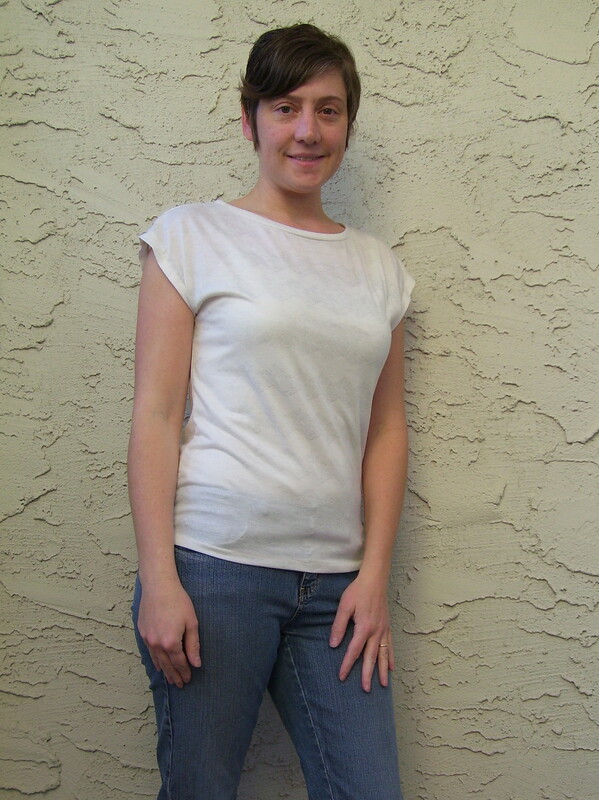 The first of much more color to come for Spring and Summer, is my version of the Rose Tshirt from Blank Slate Patterns. The gathering at the front adds some nice ease through the body without making it baggy and I did not need to size up at the hips like usual. Great pattern for a little stash busting of those quilting cottons I haven’t touched in a while. The contrast options at the neckline draw the eye up and away from the tummy and hips. I like inserting sleeves flat. Theres a full facing on the front to cover up all those seams. The seams at the front of the arm scythe are pretty bulky with three layers there. I’d recommend using a lighter weight fabric for the front facing to reduce the bulk. The arm scythe at the front curves in toward the center front a bit and causes some pulling. I’m not going to spend time to adjust the pattern as I’m only planning to use this pattern again for a sleeveless version. I determined that the triangle shape marking on pattern piece#6 needs to be moved by 1in down toward the center front to make the two front pieces #6 and #5 line up correctly. 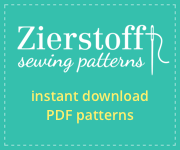 I purchased my pattern from a store, perhaps the PDF versions in the Blank Slate Patterns webstore have been corrected. Go down a size if you’re between sizes. I’m a 35.5in bust and the small sized for up to a 35in bust has enough ease for me. Understitch the facing around the neckline to prevent rolling, before top-stitching the front facing below the front yoke. 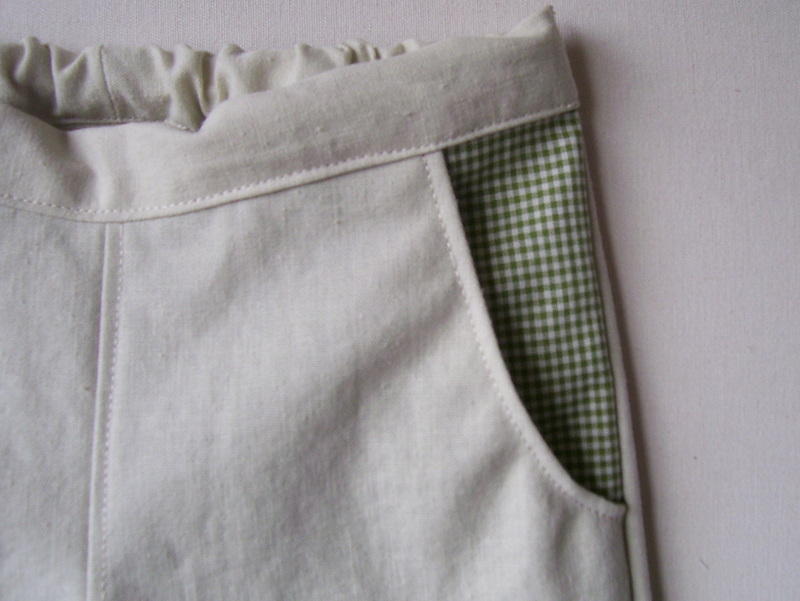 Use a lighter weight fabric for the front facing if possible, this will decrease bulk at the arm seams. Alternately, grade the seam allowances if you’re not using a serger. Lay out your front yoke pieces as demonstrated in the instructions to help keep track of what goes where. I use stay tape at my shoulder seams when sewing with knits. The Rose Tshirt takes about 3.25 hours to complete. Come on warm weather, I’d like to see you. The warmth is still a ways off for us, but that’s why we take vacations right? In honor of warm vacations to come and because I just need/want to focus on spring and summer Core Wardrobe pieces I’m trying a pattern out of my stash. McCalls 6559. I found this striped knit, in my Core colors, in the Joanns red tag section. It was pretty stiff feeling, but at $2.5/yd I thought it would make a good beach cover up and give me some practice matching stripes. To my surprise, it softened up nicely after washing. 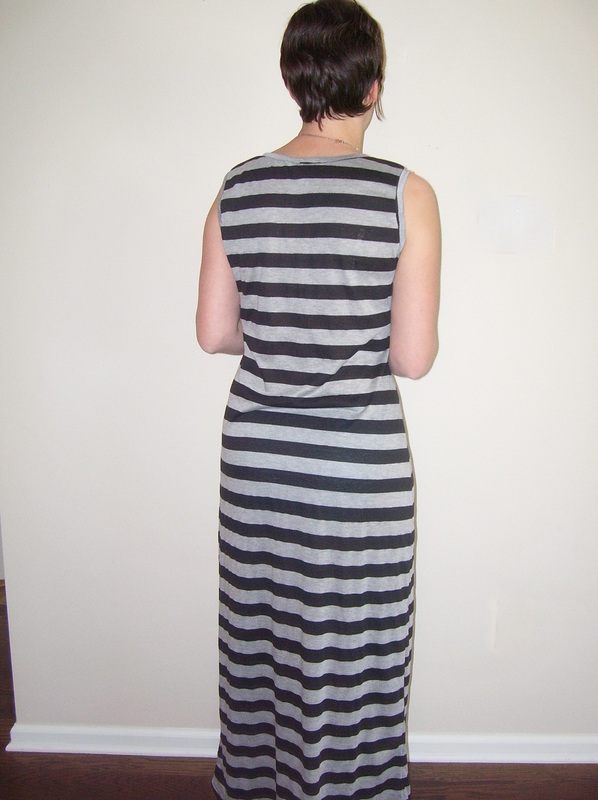 Now I have a nice striped dress for summer, bonus! I sewed up view D in a size 12. 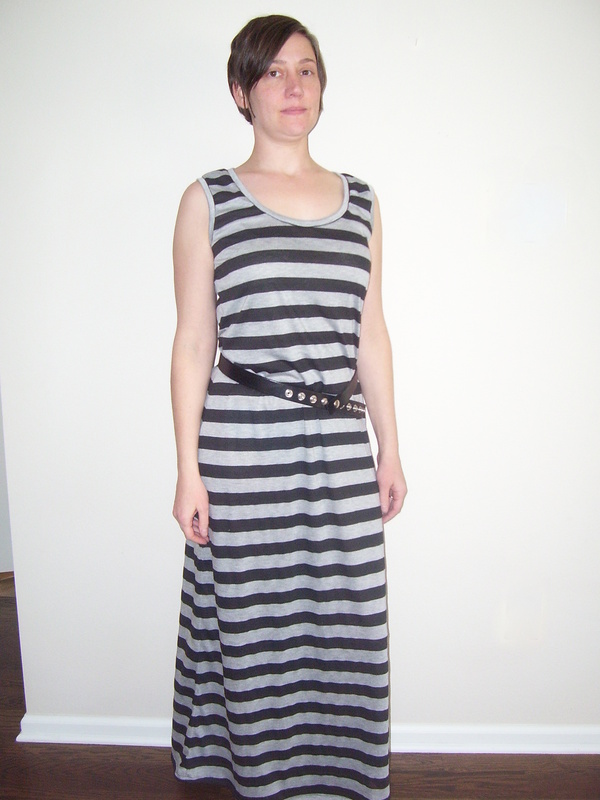 I went with the maxi length after I realized I had bought more yardage than I remembered and what the hey, why not test out how maxi length looks on me using a bargain fabric. I can always shorten it. I made a few simple modifications to the pattern and instructions. I used a 1/4in seam allowance at the sides because I was concerned about having enough width at my hips and thighs, this turned out to be unnecessary. Instead of turning and topstitching, I used self fabric as neck and armhole binding, I just think this looks better. I removed 3in from the length, I’m 5’4, and sewed the hem at 5/8in. It took extra time of course, but I’m pretty pleased with the pattern matching at the side seams. I can see this pattern being pretty useful in a lightweight knit as pajamas, as a beach coverup in the shorter length as I originally planned, and to show off some awesome prints. 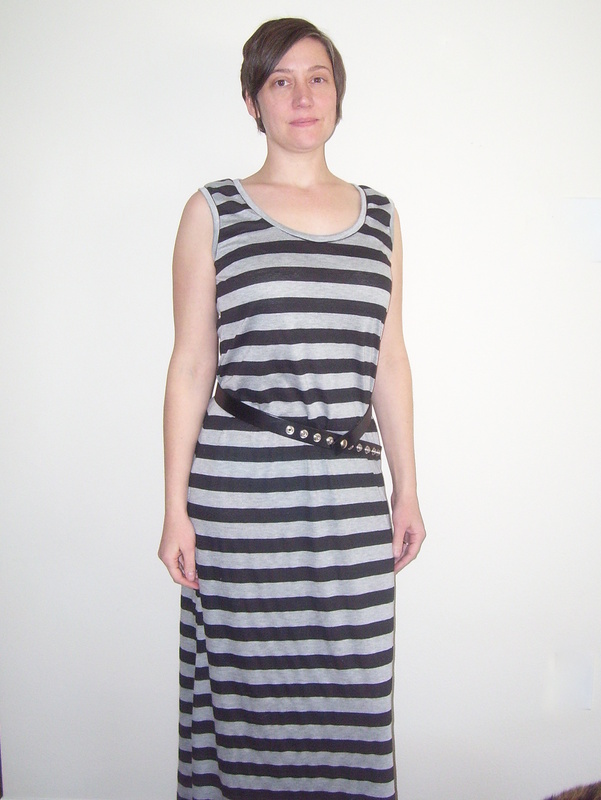 McCalls 6559 took 3 hours, including the extra time needed to match stripes and add neck and armhole bindings. 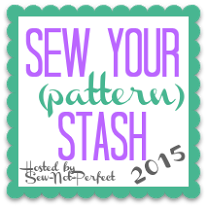 Today I’m working on building my Core Wardrobe and participating in Sew Your Pattern Stash 2015. I’m hoping to work through more of my unused patterns this year. 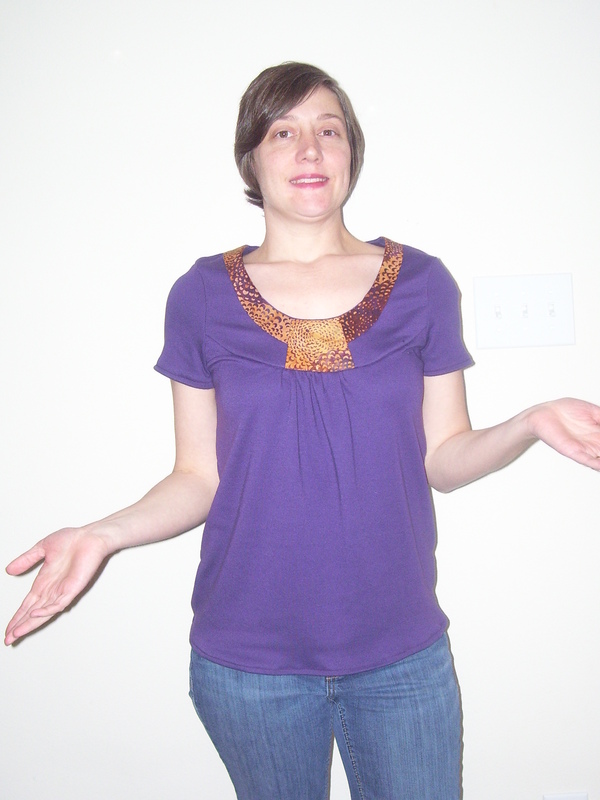 The Ann T Top pattern is from Style Arc. Their size chart suggested I should make a size 10, but after flat measuring the pattern I used an 8 instead and a 3/8in seam allowance instead of the 1/4in allotted. 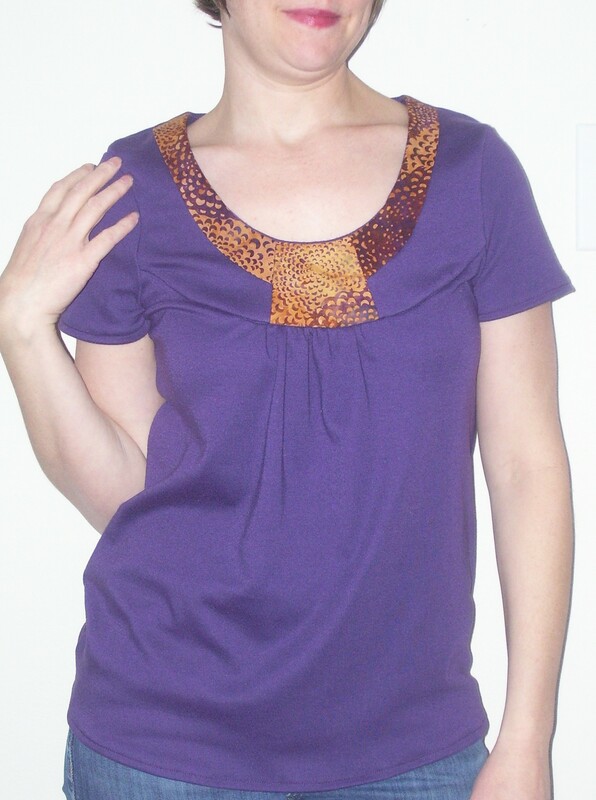 I was drawn to this pattern because of the draping across the tummy area, while still appearing to be a fitted tee. 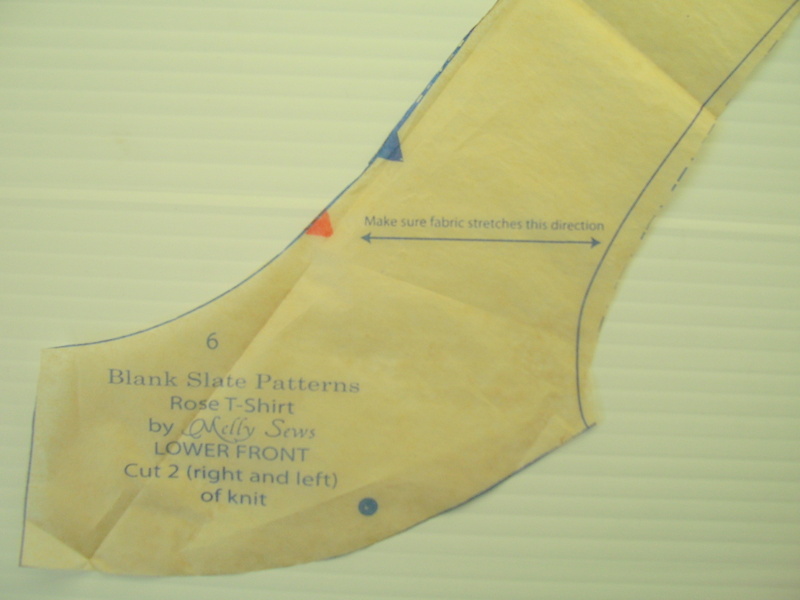 The pattern instructions would be too sparse if you’re a novice, for example there is no instruction on how to use the clear elastic to create the gathers on the front or how to insert a neck binding. If you’ve sewn knit tees before, there is nothing here to challenge you, other than using the clear elastic to make the gathers. 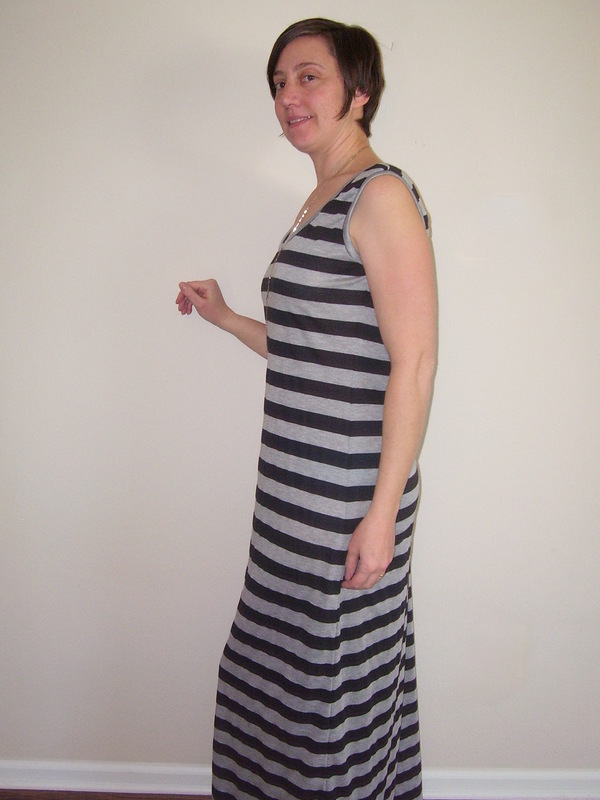 Perhaps the fabric I used, a rayon jersey knit, affected the draping, perhaps I need to go down a size through the waist and arms, but I found the overall fit still needs some work for me. I was wanting more draped folds across the tummy, instead it just bags out a little and the arms are too baggy, but these fit problems are easy fixes. I think I’ll adjust the arm width and remove the front gathers to make this a TNT pattern. This project took 2.75 hours. This is the last fall/winter Core Wardrobe piece for now. I’m turning my focus to spring/summer in hopes that I can get a few items done to wear when the warmth returns. I’m counting the Kirsten Kimono Tee as a head start on my spring/summer Core. I’m feeling the itch to take a break from making the basics I need and these basic colors. I have a couple projects lined up that I think will lift my spirits with some color. I was not anticipating having to knock out more pajamas this year. (Sorry Core Wardrobe you’re at the back of the line again.) 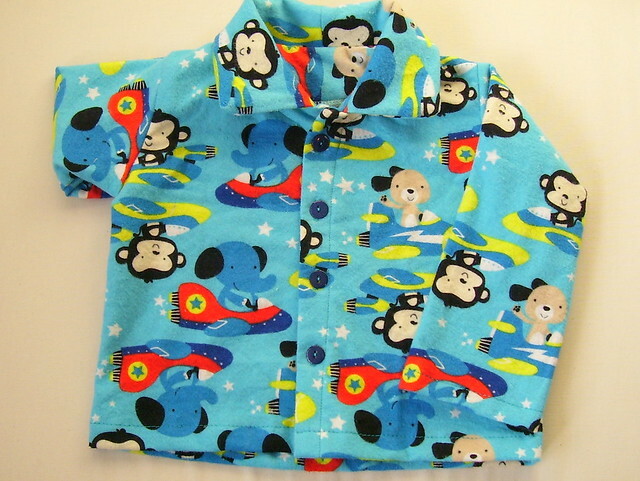 In rare form, I planned ahead for winter clothes for the little guy, even making one more set of pjs for him in August. 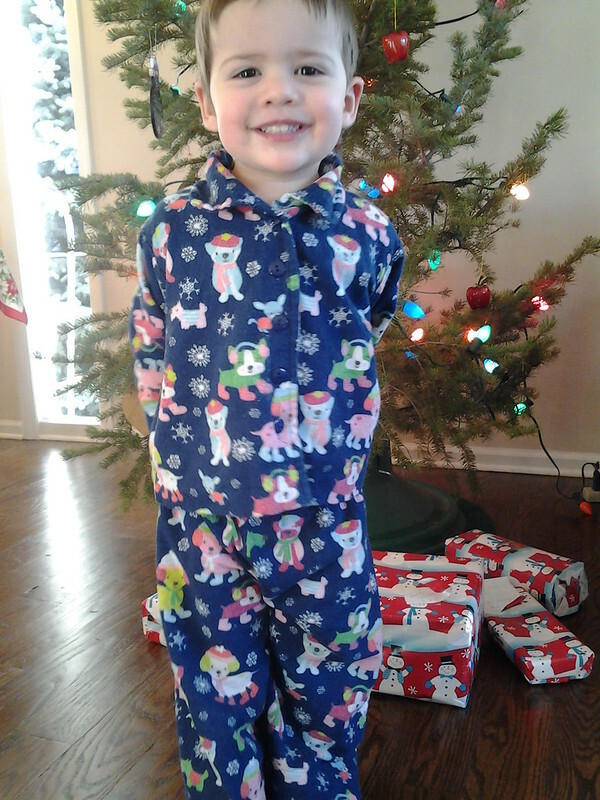 Now all of a sudden toes are popping out of footie pjs and torso and arms are longer than his pj tops. Thank you Shwin & Shwin for your free Pajama Rama pajama set pattern to solve my dilemma. 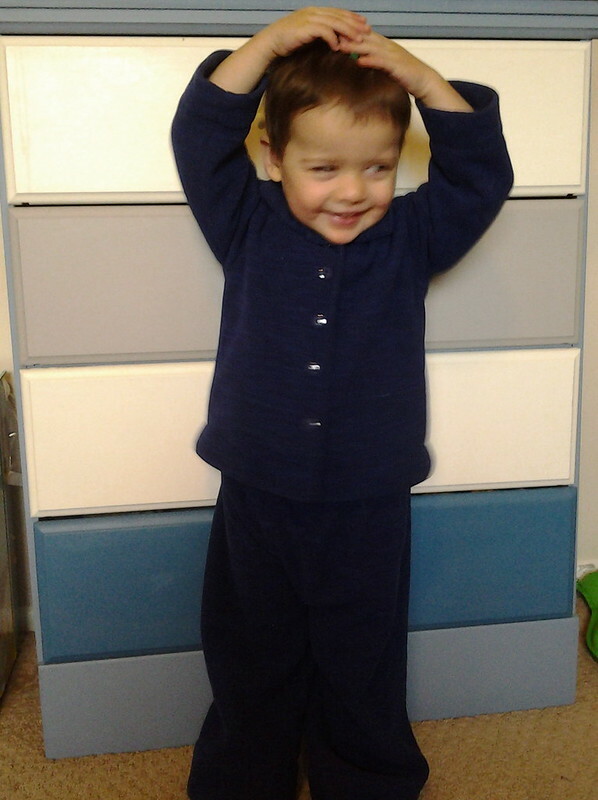 I made this 4T pattern for my almost 3T little guy with the hopes that I can just lower the really deep hems next winter. We’ll see. Aren’t those puppies so cute? 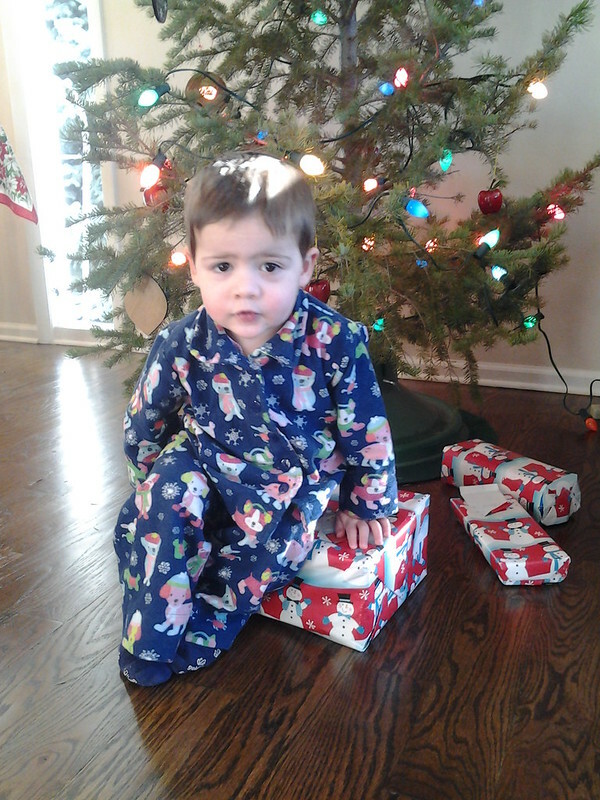 This flannel was originally intended for his Christmas Eve pjs, but necessity meant he was wearing these early. -And yes I know flannel isn’t made for kids pjs. I’m a grown up, my choice. Do you see my goof up? Puppies on one sleeve are “uppa see down” as my son would say. Yeah, I didn’t notice until I was sewing the button holes, so you know, not gonna fix it now. Here’s a second version I made out of a stretchy polartec fleece. This last set I made this week is under wraps until Christmas Eve. As far as sewing for myself goes, I took a little break from Core Wardrobe pieces to work up an idea I had for a modified version of the Tonic 2 Tee by SBCC. I really like asymmetry in clothing, so I modified the neckline a bit to make it interesting. 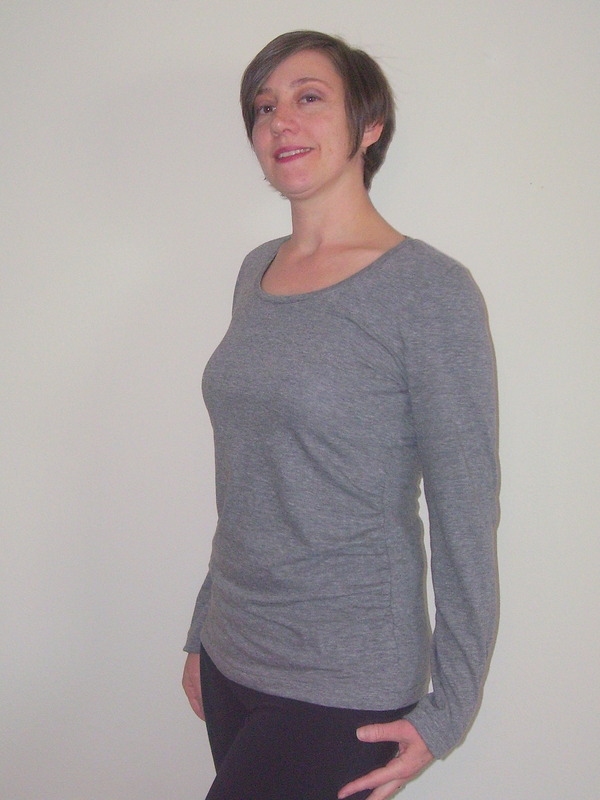 I used a bit of the left over black knit from my original Tonic 2 Tee as the neckline trim, waistband, and cuff bands. I removed 3 inches from the lower bodice and added a 3in band in the contrasting fabric. From the sleeves I removed 1in in length and added back a 1in band. I measured my new neckline length and subtracted 15% to get my new neckline trim piece. That math worked well. Next time I’ll make the neckline trim a little wider and make the shape of the neckline opening a little more like a crew. I’m pretty pleased with the result. This go around I made the small and the fit is so much better. 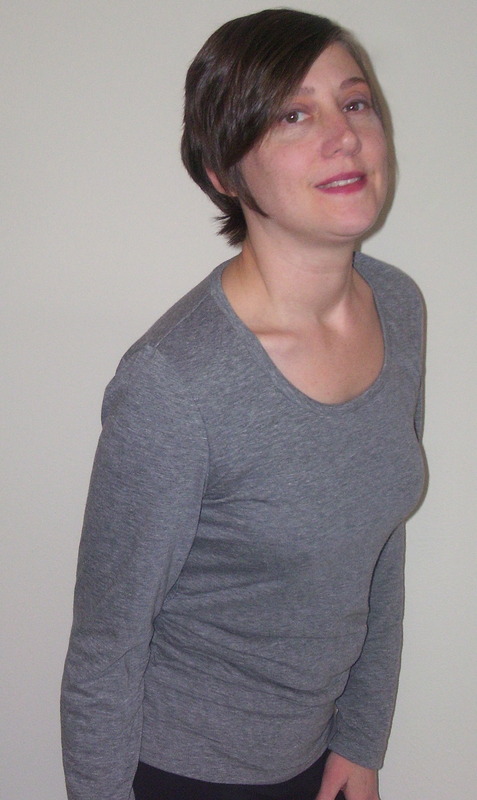 Other than the narrow neckline band, it really came out pretty close to what I was imagining. Thanks to a lot of hand me downs and grandma volunteering at the thrift store, my LO is pretty well stocked for clothes. Gone is the idea that I would make most of his wardrobe, but thankfully there is opportunity to fill in some gaps. 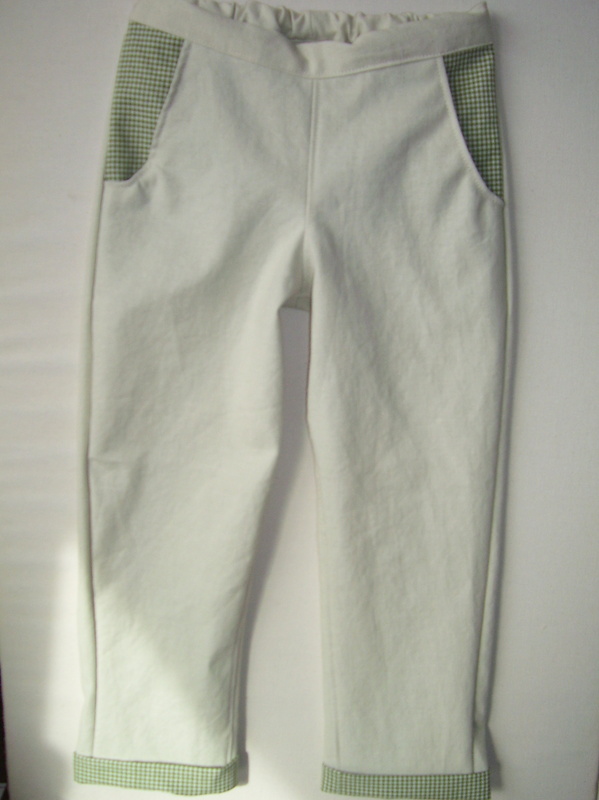 This week I worked up some trousers using the Clean Slate Pant pattern from Melly Sews and used a linen with a greenish cast and a green checked cotton from my stash to do it. 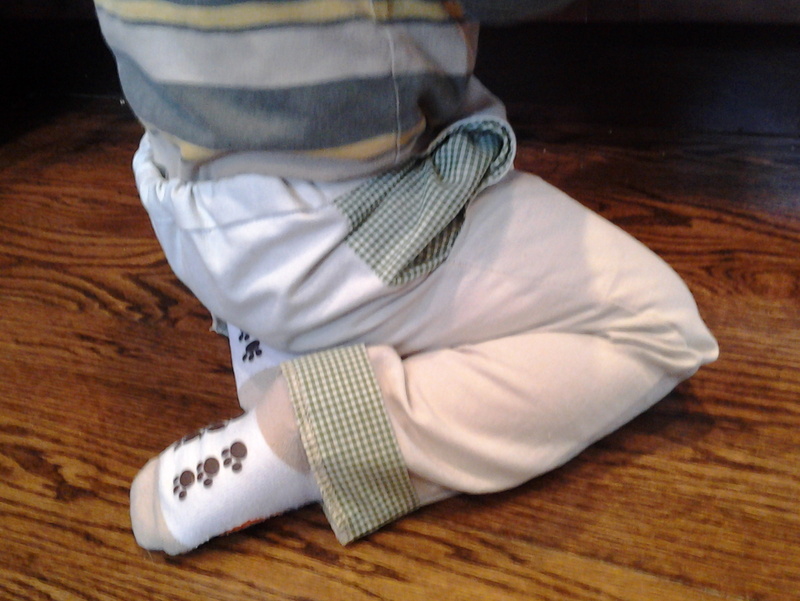 LO seems to out grow his pants in length long before the waist, so I modified the pattern just slightly to add a contrast cuff that I could fold up to start and then fold down as LO gets longer. 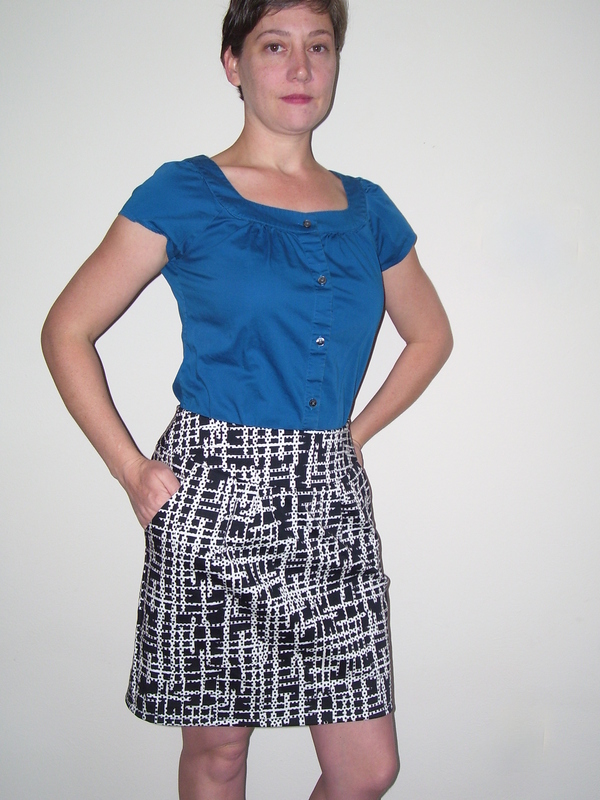 The pattern includes a 1.5in hem allowance. I reduced that down to a 0.5in seam allowance and added a 1.5in finished cuff instead. Supper cute and a great idea. Its too bad I didn’t check the finished length on the pattern to see that they would be way too long for my little shorty. Whoops. 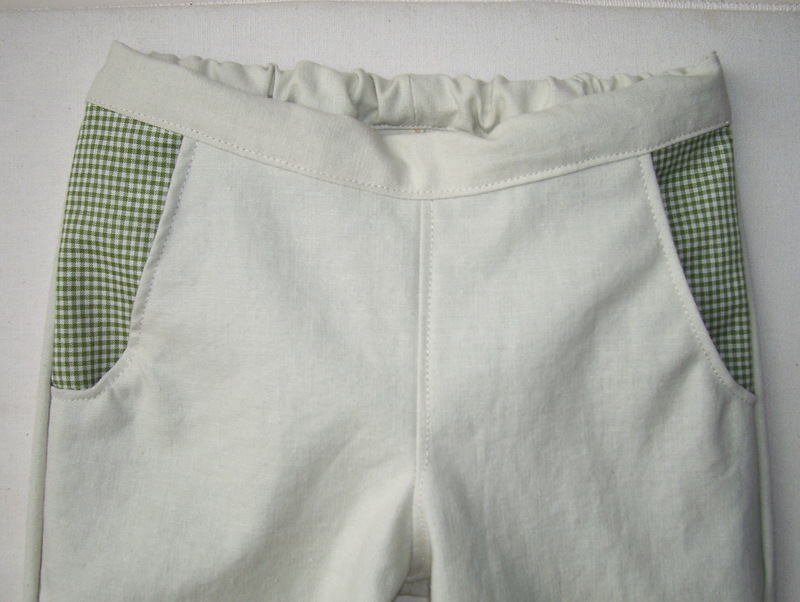 To add extra sweetness and to tie in the contrasting cuffs, I used the same green checks for the pockets. The project took me two and a half hours all together. 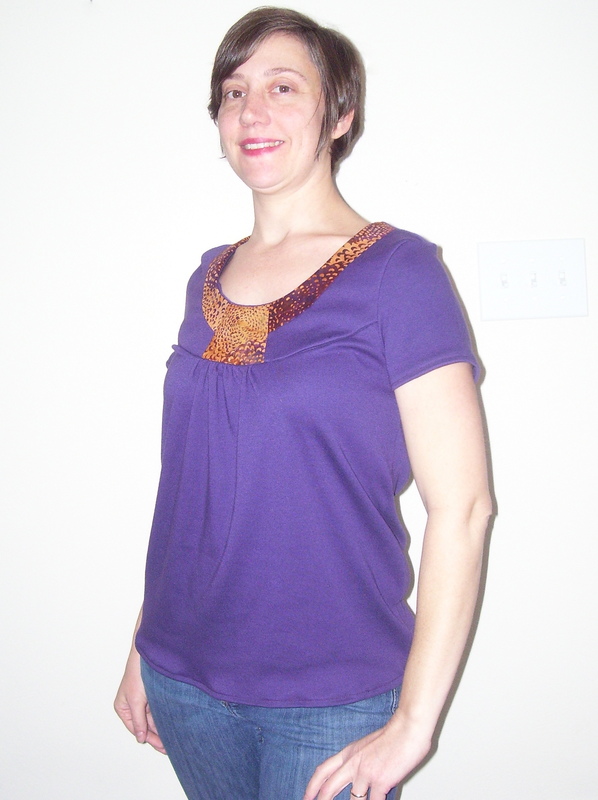 This is the second pattern from Melly Sews that I’ve used. I’d recommend her patterns for sure. She gives clear instructions and has good pictures to help you along; plus she’s an indy pattern maker. I originally pulled out this linen to make a sorbetto dress for myself, but as pale as I am its not a good color for me to wear. I’m pretty tempted to go ahead with the dress and use the green checks as bias tape trim on the inside neckline. Wouldn’t we be such a cute mommy and son pair? I should stick to my first thought though, since he’ll outgrow these pants in a blink of an eye and I’ll still have a dress that makes me look washed out.